Jermaine Samuels (left) will remain, but both Eric Paschall and Phil Booth are moving on after Villanova's loss to Purdue. HARTFORD, Conn. – Long before the fans watching on television or at the XL Center knew it on Saturday night, and before even the players on the floor were aware, Jay Wright knew Villanova was in trouble against Purdue in its second-round NCAA game. The level proved good enough for the Wildcats in the Big East regular season and the conference tournament, but after grinding out an opening NCAA win against St. Mary’s, Villanova couldn’t climb the next step. It got late very early in the game. The Wildcats were down by double digits eight minutes into it, by 19 at the half, and by 35 when Purdue scored the first 16 points of the second half. The 87-61 final was Villanova’s first NCAA loss by more than 20 points since 1970, when Bob Lanier went for 26 points and 14 rebounds. Lanier is currently 70 years old, so it’s been a while. If Wright was worried about this season’s team for those reasons, he has a few worries about next season’s, as well. Villanova won’t have a senior in the playing rotation and, while the team should be deeper, it won’t be as tested. From a talent perspective, the building will take place quickly. Villanova has either the second- or third-ranked incoming recruiting class nationally, depending on which rating service you prefer. The projected stars of the class are 6-foot-9 power forward Jeremiah Robinson-Earl, who is from Kansas but finished his prep ball at IMG Academy, the high-powered feeder in Bradenton, Fla.; and 6-5 combo guard Bryan Antoine, from Eatontown, N.J. Both are five-star recruits, joined in the incoming Villanova class by 6-4 shooting guard Justin Moore from DeMatha, and 6-7 forward Eric Dixon from Abington. Robinson-Earl and Antoine are not expected to be four-year college players, so Wright is diverging a bit from the prototype Villanova recruit. There are risks to that, but certainly potential rewards, too. At the moment, next season’s roster will have three juniors (Collin Gillespie, Dhamir Cosby-Roundtree, and Jermaine Samuels), four sophomores (Saddiq Bey, Cole Swider, Brandon Slater, and Jahvon Quinerly), and the four freshmen. It wouldn’t be a surprise if Quinerly, also a five-star recruit, but one who didn’t fit into the rotation, transferred out. Even if that happens, however, Wright will have a lot of pieces to fit together in a short period of time. Before moving on to next season, Wright and his staff have to put this one to bed. The team will meet on Monday for a last farewell together, including seniors Phil Booth and Eric Paschall. 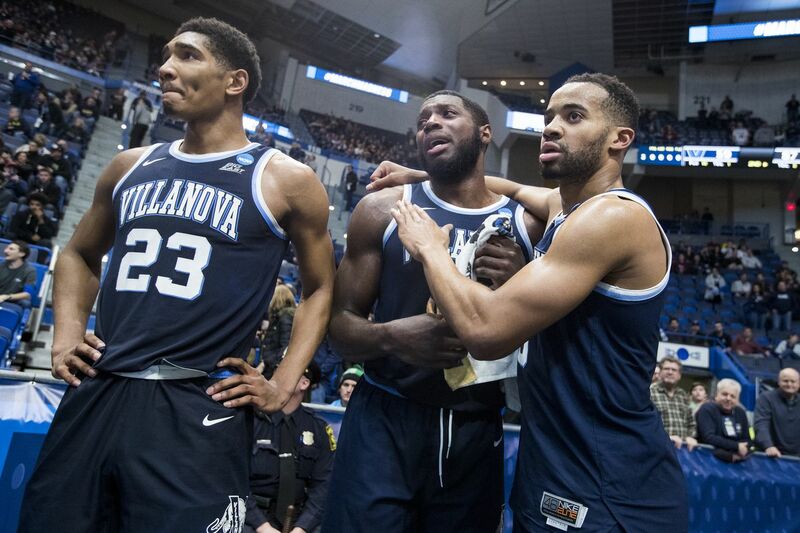 Booth was a freshman when JayVaughn Pinkston was a senior, so his career reaches back across two Villanova generations, and his departure feels like the closing of a program chapter. Oh, boy, did it ever. Maybe this loss was destined to arrive eventually with the wrong kind of matchup, but Wright held out hope that a little more time and few more practices might make the difference. He wouldn’t get that time, however, and the coach knew it before anyone else.